The fourth title in our “Parr/Nazraeli Edition of Ten” (titles 1 through 3 shown left), Raimond Wouda’s School shows groups of pupils at numerous secondary schools in the Netherlands. Rather than depicting classrooms, Wouda chose to photograph the places where students relax between classes, placing his large-format camera high on a ladder and triggering the shutter from the ground via remote control to capture specific moments. 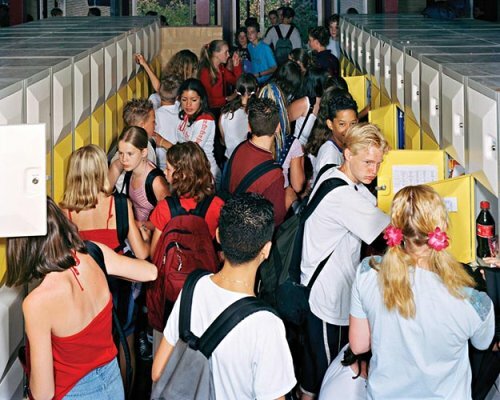 According to Wouda, the current debates about substance and behaviour in secondary schools have gone unnoticed by the students themselves, for whom school is a relatively safe place in which to meet and interact with their friends, and to discover their own identity.